Driving under the influence of alcohol is what generally comes to mind when people hear the phrase “DUI.” It is important to understand, however, that “driving under the influence” can also refer to being under the influence of any mind altering substance – including prescription drugs. Arizona law is structured in a way that makes convicting someone of a drug related DUI simpler for prosecutors than is a case involving alcohol. If you have been arrested on suspicion of driving under the influence of drugs then you need to contact a criminal defense attorney right away. Bretton Barber is a Phoenix area lawyer devoting his practice to defending Arizona’s accused. Contact our office to schedule an initial consultation. 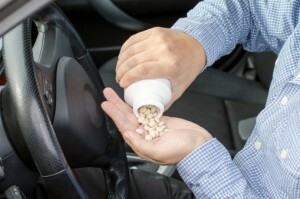 A drug-related DUI is different than one based on alcohol. While alcohol related cases require one’s blood level to show a certain level of impairment, a person may be charged with driving under the influence of drugs if they are under the “slightest degree” of influence from a controlled substance.This is true even if one has a prescription for medication which is causing impairment. In other words, you can receive a DUI if you are under the influence of medical marijuana, pain medication, and certain medications which are taken for anxiety. It is up to the prosecution to prove that you were in fact “under the influence” of such drugs. This offense may be charged as a misdemeanor or a felony. Bretton Barber assists Arizona residents facing DUI drug charge.s He will immediately examine the evidence against you to determine the best possible defense. If drugs are not found in your system then it will become a matter of whether your behavior showed you to be “under the influence.” If drugs were found in your system then Bretton can challenge the procedures used by the police in handling blood samples. Also, as with other DUI cases, if the officer did not have reasonable suspicion to stop your vehicle then he or she likely violated your rights against search and seizure and it may be possible to have the case dismissed. You are facing a serious situation and you can rest assured that our lawyer takes such matters seriously. Contact our attorney today. In addition to Phoenix we represent defendants in other Maricopa County cities such as Mesa, Glendale, Scottsdale, Chandler, and Gilbert. We also assist Pima County residents in Tucson. Many arrests that are made on the basis of DUI suspicion occur because the officer claims to observe evidence of drugs or drug use. He may claim to smell the scent of marijuana, or cite behavior consistent with drug use such as slurred speech or unfocused pupils. However, if your car is searched and drugs are found then it is possible that your rights were violated. An officer must have “reasonable cause” to conduct a search and he or she cannot create the “reasonable cause” after the fact of finding drugs. If illegal drugs are found in your vehicle you may be facing compound charges of both possession and DUI, which will increase your sentence, penalties and fines. However, if you were searched illegally it may be possible to have all charges dismissed. Bretton is able to handle the possession charges and DUI charges simultaneously; while your case may feel dire, under certain circumstances, it may be possible to have all charges dropped. In other cases it may be possible to have the charges against you dramatically reduced. Contact our office today to schedule consultation.